And my hubby-to-be is one of them. John loves spicy things! He also happens to have a midnight snack habit that often involves a peanut butter and jelly sandwich. I know this because of the evidence I find in the morning- crumbs, empty jelly jars, a dirty knife in the sink. We seem to go through a lot of jelly. 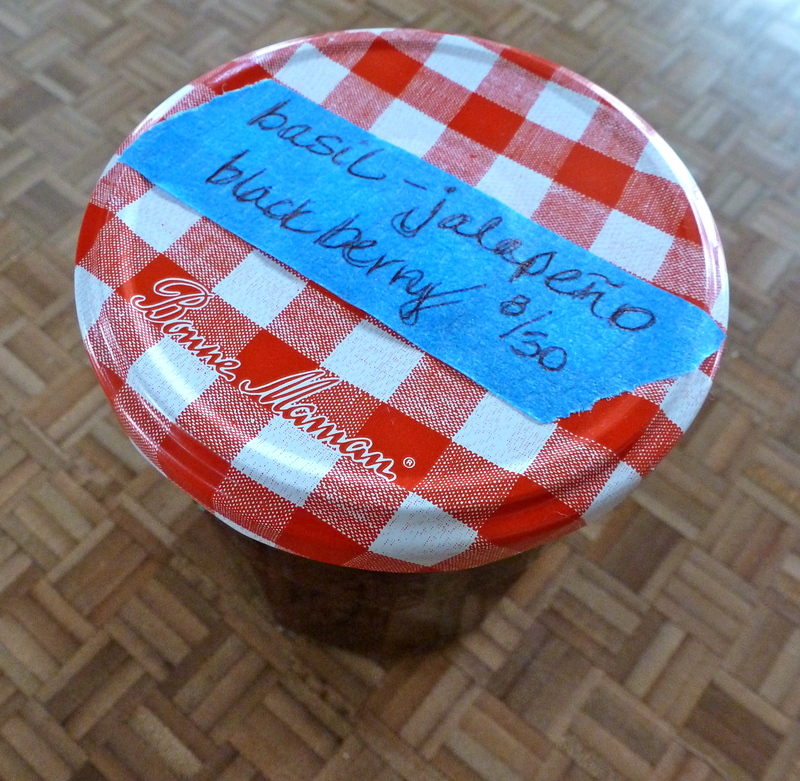 When we visited our dear friends in California recently, our hostess sent us home with blackberry jam she had made from the berries on a bush in her backyard. Hello! John wasted no time… and the jam didn’t last long. 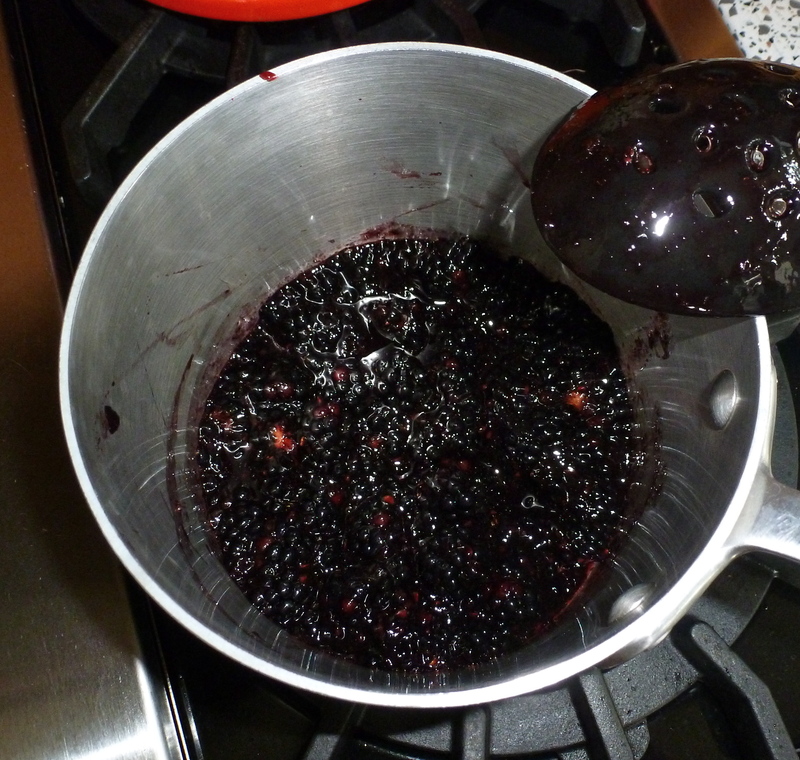 Inspired by Lazuli’s sweet gift, I made blackberry jam today…with a kick. Someday, I’d like to learn how to officially make jellies and jams. This version is simple and quick, and because it doesn’t include pectin or another preserver, it must be eaten within a week or so. There are only a few (beautiful) ingredients. The process is so easy! First, I muddled the fruit in a small saucepan. I wanted to get some of the juice out of the berries. I just used the back of a spoon. 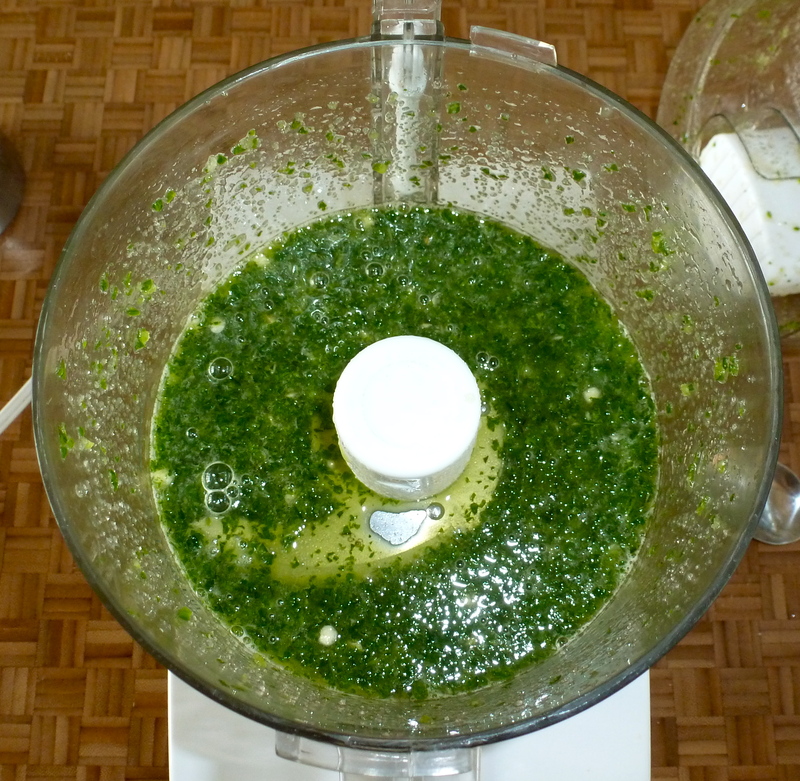 Next, I used a food processor to combine some sugar, basil leaves, orange juice, and half of a jalapeno (with seeds- that’s where the heat lives!). 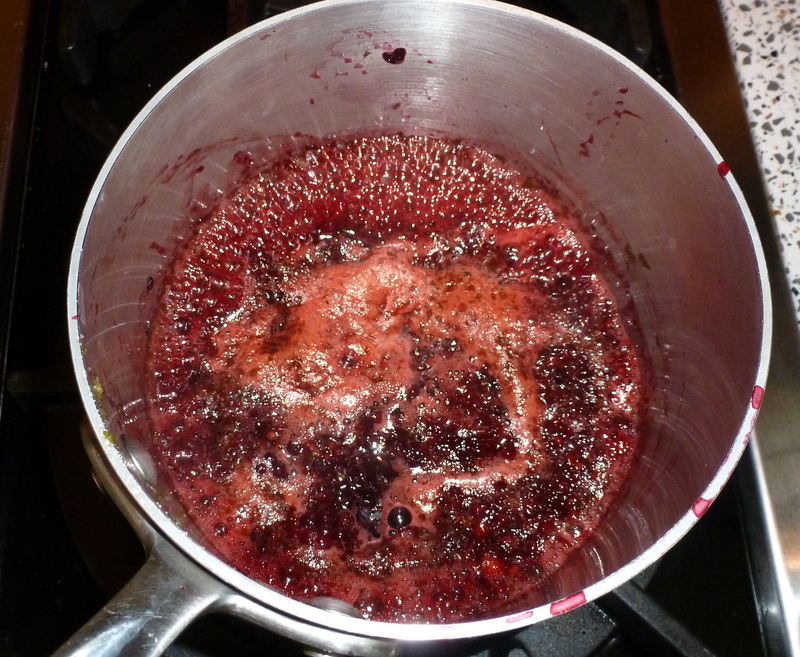 I stirred the sugar mixture into the berries and brought it all to a happy simmer on the stove, where it bubbled gently for about 30 minutes. I stirred it and smooshed bigger berries every once in awhile. Simmering basically broke down the berries and let all of the flavors combine as the mixture reduced. After about a half an hour, I turned off the heat and let it cool completely. It got thicker as it cooled. Then it went into a cute little jar (one of the midnight snack remnants). And that’s it. I told you it was easy. 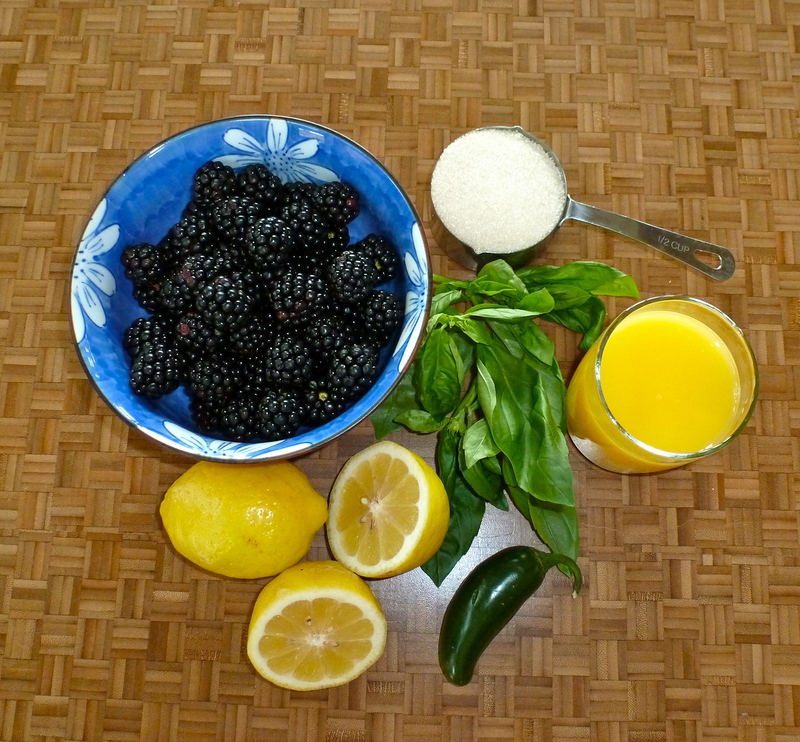 The flavor is still sweet like a jam, but the basil brings a new flavor that works well with the blackberries. The jalapeno heat is definitely in the background, but it’s there. It’s not your average jam. Yum! Hmmm. I wonder how hard it is to make peanut butter? 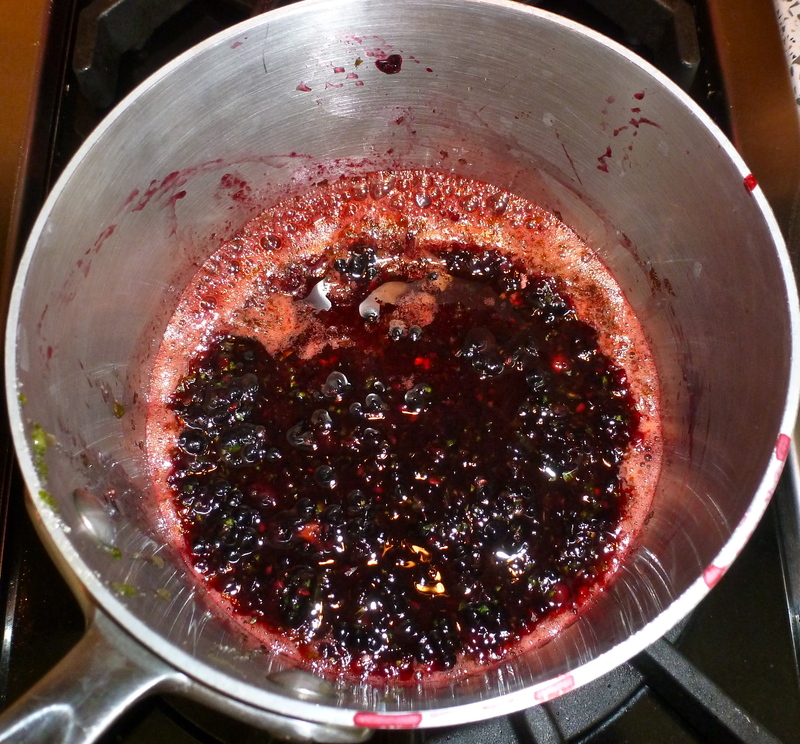 Muddle the berries in a small saucepan to release the juice. 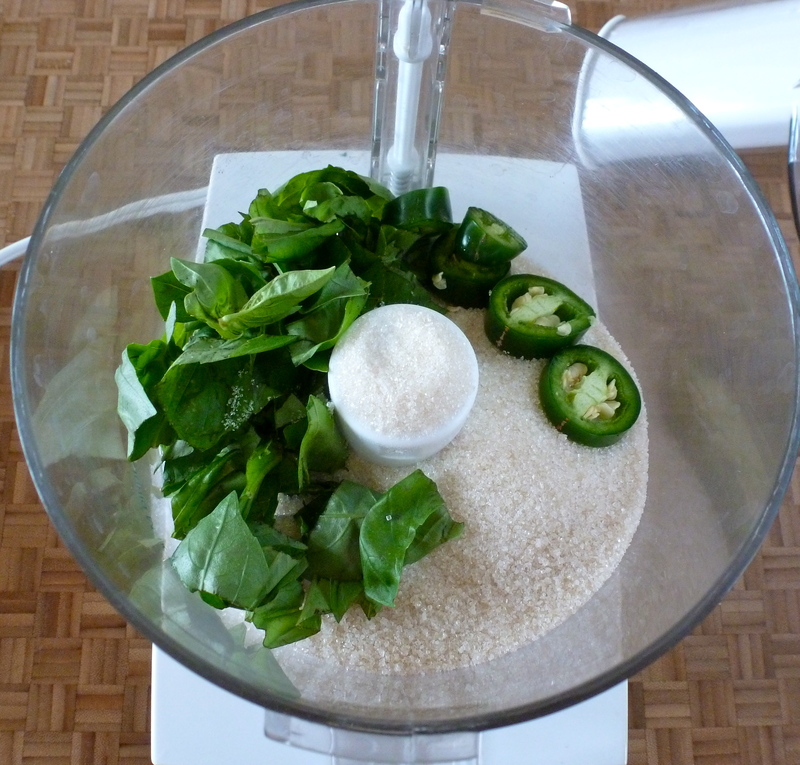 In a food processor, combine the rest of the ingredients and blend until smooth. Add this mixture to the berries. 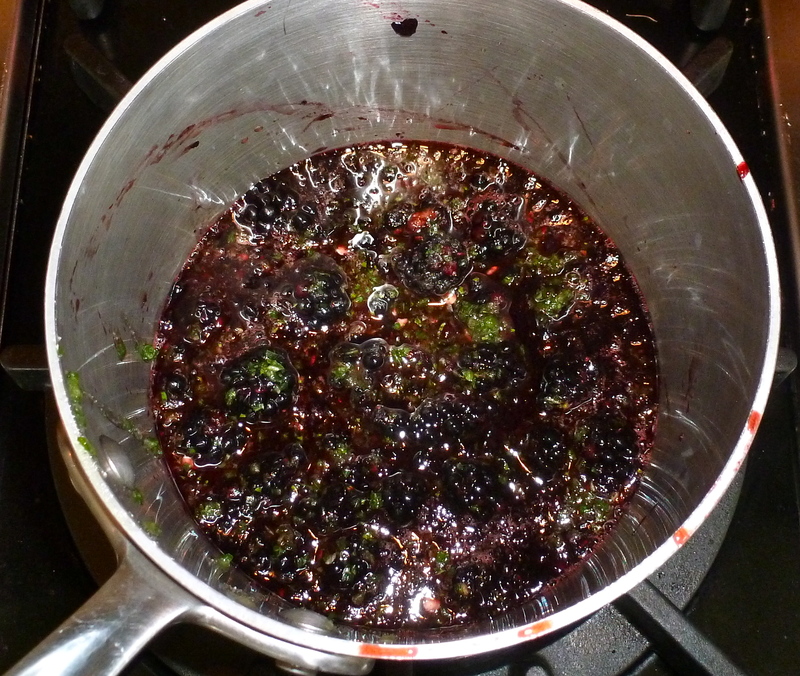 Simmer on medium-low heat for about 30 minutes, stirring and breaking down larger berry chunks. 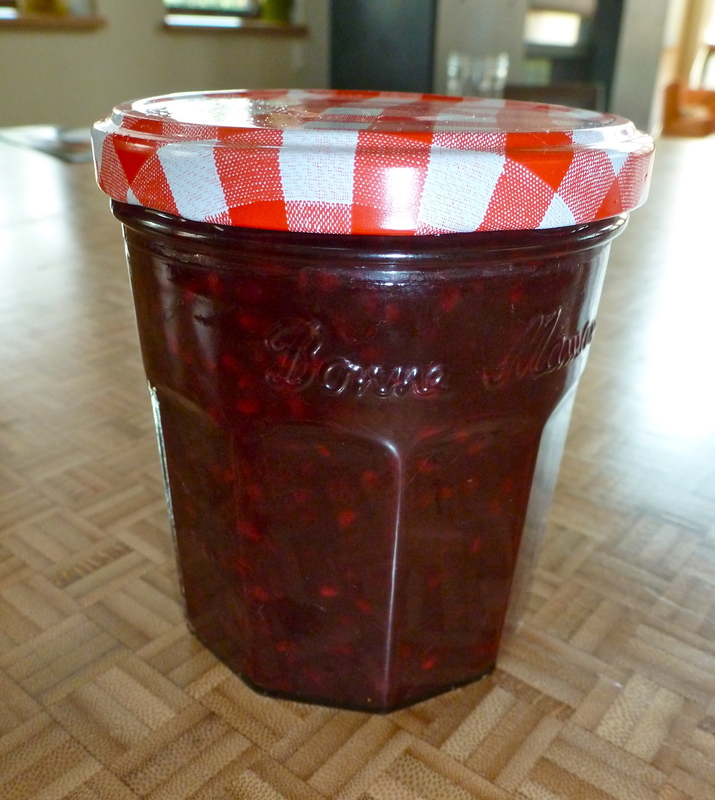 Let the jam cool completely before storing in the refrigerator in an airtight container for up to a week. Serve it on toast, or maybe mix into cream cheese and spread it on your bagel. Be sure to leave it in an convenient place for midnight snackers. Delish! Ohhhhhhhh my goodness. This one is going on the “to make” list. THANK YOU from the bottom of my spicy-sweet-sauce-loving heart. Holy deliciousness! This looks like a recipe even I can handle – definitely a keeper. Thanks for sharing and can’t wait to try it out! You definitely can! It mostly involves a little stirring and then patience while it cools! mmmm. That sounds amazing! And oh so unique! Wow. I want to live next door to you. I would totally share jam with you. I would totally make you some peanut butter. I’m going to make this today! Your coment about using it immediately because of no pectin. 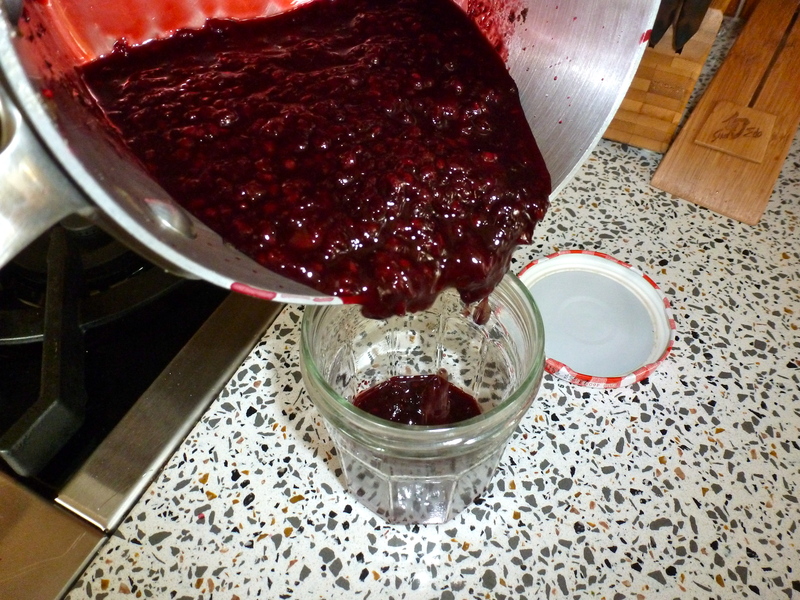 I make all my jams without pectin and process in a water bath. They keep for years! The sugar is your preservative. Just process in boiling water bath for 15 minutes following all the “steralized jar routine”. Thanks again for the great idea! I love Basil! I need to get the equipment to boil the jars. I hope the jam turned out to be delicious for you!